It was a slower morning than usual, but we made it up in time to meet up with the newlyweds an enjoy a beautiful horseback riding loop to the waterfall behind the hotel. I was ready for the experience we had last time, with slow horses that followed each other with little input from their riders. This was wrong. The brisk morning air and beautiful sun made for a perfect experience. I hopped on my horse, nicknamed Sunny, and grabbed the very short reigns. Sunny had a mind of his own and I actually felt like I used the little horse knowledge that I possess to make sure I didn’t end up on the ground. As the group started out, I was surprised to see how quickly we picked up the pace and as such, I ended up spending a large amount of my attention on the task of remaining on Sunny. I kept whispering bad jokes to myself, “I hope I don’t end up Sunny side up”… ect. But once I realized that I only needed to apply a bit more force to my inputs, I became more confident and finally relaxed in time to enjoy the spectacular waterfall that was just minutes out of the hotel door but hidden from view. 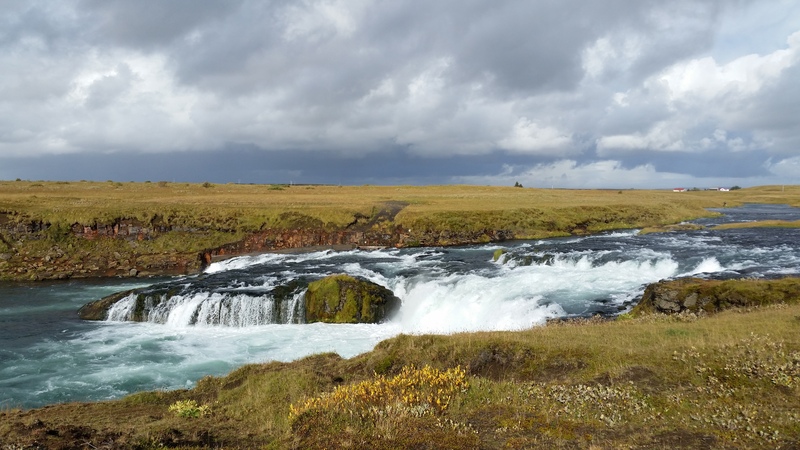 I noted someone fishing in the river and recalled a fact that someone had told me that all rivers in Iceland were privately owned and that it cost a large amount of money to fish – to the tune of $800 per day. My thought was that it was probably either a local fishing or someone had told me a false fact to deter me and others from fishing their waters. Sunny and I followed the group around the bend, through a few streams and eventually back to where we started. 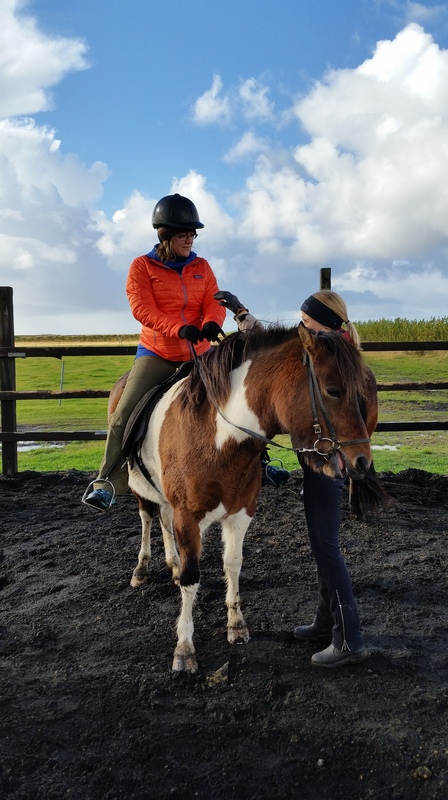 It was a stunning experience and I fully enjoyed the challenge of learning how to control a horse. The guides who took us around were a lot more down to earth, took the time to answer our questions and let us feed the horses after the journey. The helped us to understand that they will soon be closed for the season and that the horses will be put out to pasture where they will take care of themselves for the winter. We were shocked! But, as they explained, the animals on the Island were used to the conditions and that if anything unusual happened, they always had someone on the lookout ready to help. The horses playfully bit each other, rolled around and in general acted like a pen of a dozen over-sized Labradors. They are truly amazing creatures. Our friends graciously shared their reception leftovers with us for lunch, which only cemented the fact that Hotel Stracta was a great place to eat. We then attempted to head to the Westman Islands where we were hoping to see the baby puffins take their first flights out to the sea. With the intensity of a wildfire, I wanted to partake in the “puffin tossing” tradition if the opportunity was available. This, along with the sealife aquarium where you can pet a puffin, and the volcano museum which catalogs the events of the eruption on the Island in the 1970s sounded like the perfect day. We had planned to jump onto a ferry and walk around the Island for a great afternoon of new experiences. The waves and ferry service had a different plan. After checking the facebook page of the ferry service as well as the front desk of the hotel, we learned that there is no guarantee of a return ferry or that if the ferry does return that it will go to this port. Reluctantly, but rather quickly, we changed our plans. 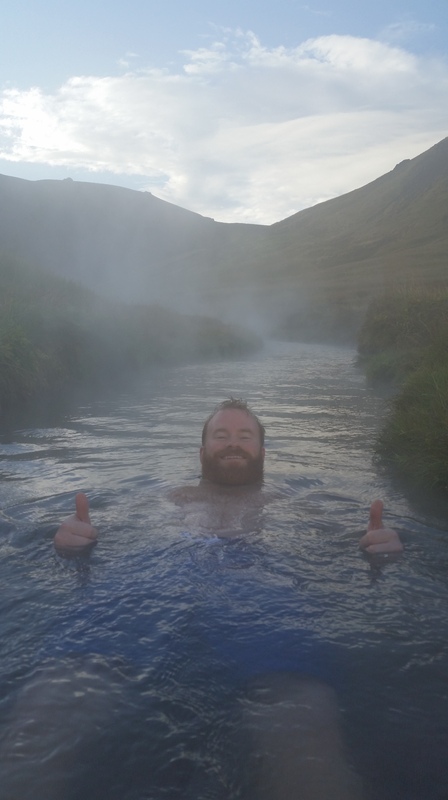 We consulted our long list of things that we wanted to do in the area, and selected the hike to the river you can use as a hot tub that we found out about on our last visit to Iceland from a nice gentleman named Staindor who was staying at our hotel. The newlywed couple joined us for a fantastic excursion 45 minutes to the west of the hotel. The Hveragerdi area was even more stunning. 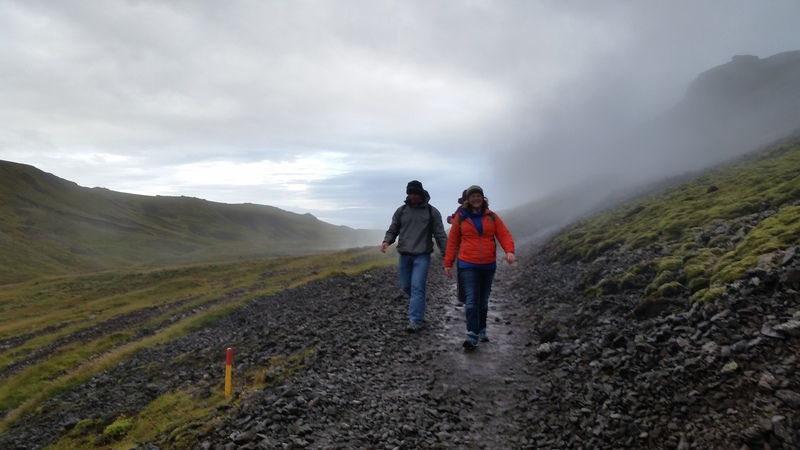 We were under the assumption that this was not a well marked area, however, Reykjadalur was very clearly marked and had a very well beaten path. The 2 miles that we hiked to the river treated us with views of the steaming streams, beautiful fall colors, the experience of all 4 seasons in the span of about an hour, including hail storms, 50MPH+ wind gusts, sun shine, rainbows, and rain. 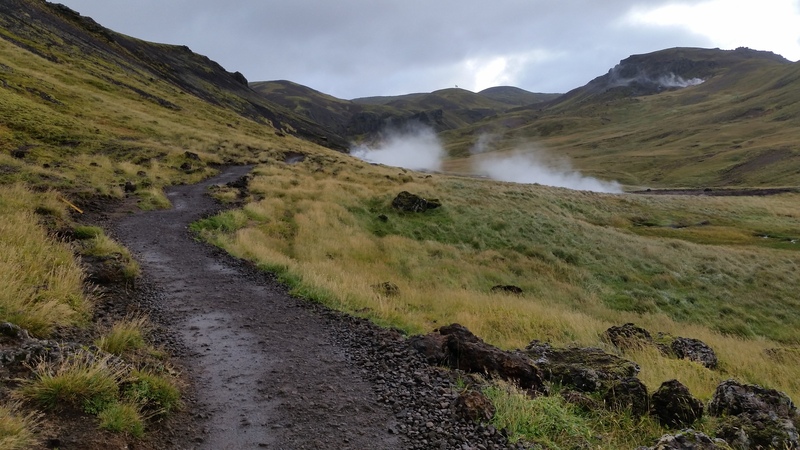 A descending hiker exclaimed, “go to the furthest changing house, that is where the water is the warmest”, which changed my vision of what was about to happen. I didn’t imagine changing houses. I imagined picking a big rock to change behind. All of a sudden I was excited that the only supermoon that would be witnessed in Iceland was the one that was happening in the night sky that evening. It turns out, I should not have adjusted my expectations. We gleefully headed toward the trex deck based trail that led to steps which led to the water. Quick hand dips confirmed that we were at the right place. The “changing houses” where neither houses or a place to change in privacy. So – there was a double full moon in Icland that day. We excitedly changed into our swimming gear then flopped into the river like migrating salmon. The environment treated us to another cycle of the seasons – hail, wind, rain, sleet, gusts and eventually sunshine. We didn’t care. 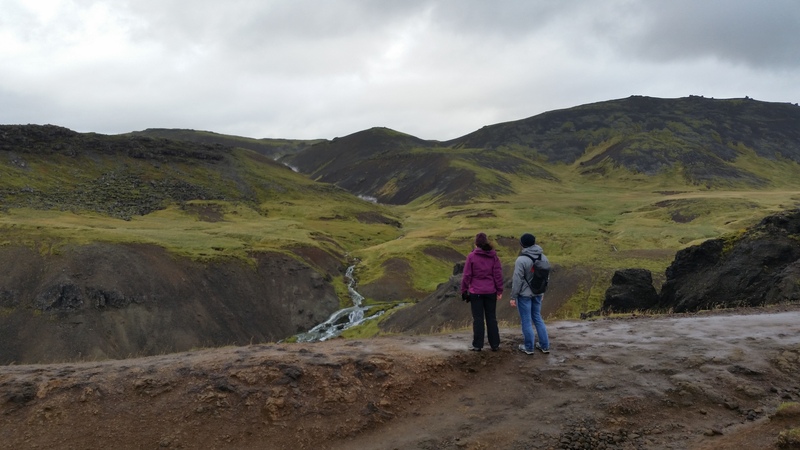 We were soaking in the natural beauty of Southern Iceland. Matt had fashioned a rain barrier around our stuff so it didn’t end up too soaking wet. 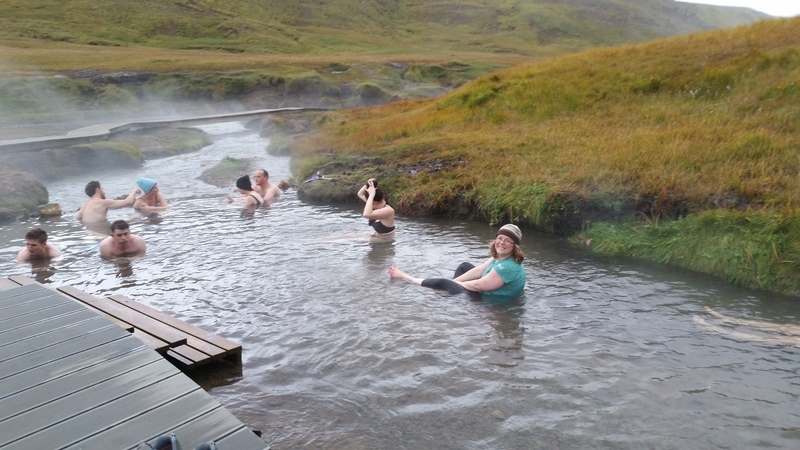 We enjoyed 45 minutes of bliss in the geothermal heated water while the tops of our heads were covered with the warmest wool hats we possessed. Note to self – next time bring flip flops and a plastic bag! The hike back was pleasant and dry. The sunny skies turned to dusk as we reached the car. The soup stand at the trailhead had closed, so we set out for dinner at a place closer to the hotel in Selfoss called “Surf and Turf”. It was as it was named – a great place for steak and lobster tails. But not just one lobster tail. 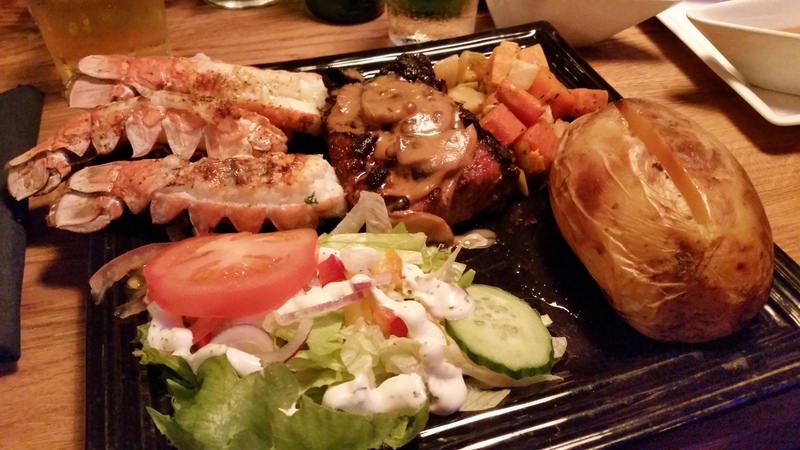 If you chose to add the surf to your turf, you were given four lobster tails. It was incredible. 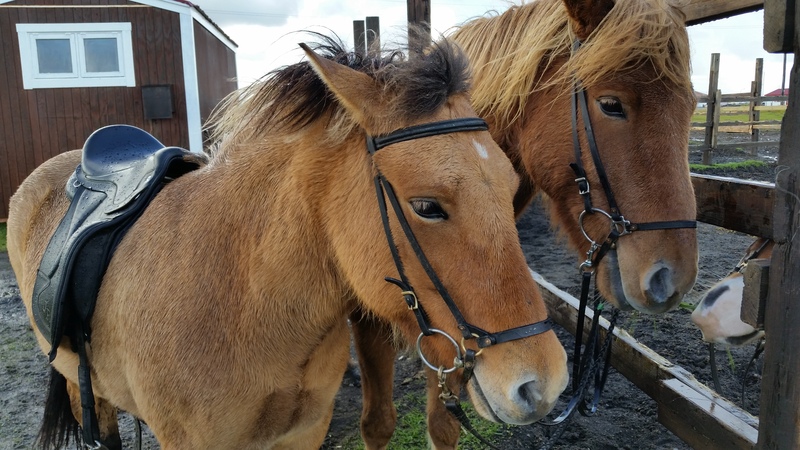 I couldn’t help but re-taste an Icelandic tradition – Horse. I wanted to see if it was as good as I remembered from my inaugural meal at 3 Frakkar. It was delicious, but not as delicious as the previous. The mushroom and pepper sauce was delightful and the beer was… light but local, so paired nicely with the meal. 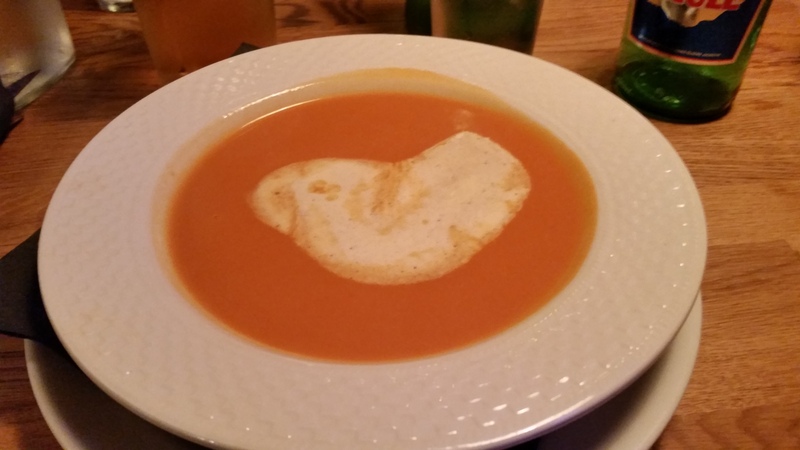 The tomato soup was fantastic! We were thrown off by the horse paining on the wall, but overcame the awkwardness once the food came. We were famished from the days activities not to mention the saddle sores that were starting to set in. Upon returning to the hotel, we checked the forecast for the supermoon event that was to occur around midnight. Again, I headed to the bar with my laptop in an attempt to capture some notes about the trip, and was again thwarted by beckoning conversation and getting to know new friends. I happily closed the laptop and enjoyed the experience as we waited for the eclipse to start. There was a gentleman at the bar who mentioned that he was Icelands motocross champion. When asked, he mentioned that he knew of one of our local Butte, Montana motocross champions as well. Very small world! We chatted until the event was to start, grabbed our drinks and headed outside, with camera in tow. Turns out… the beginning of an eclipse isn’t that exciting. Over the next hour, we traveled in and out checking the sky until you could tell that things were in motion with the naked eye. Matt used his photography expertise to capture a beautiful corona around the moon and the eclipsing phases of the moon. You will notice that the pictures stop when the moon is still about 20% visible. 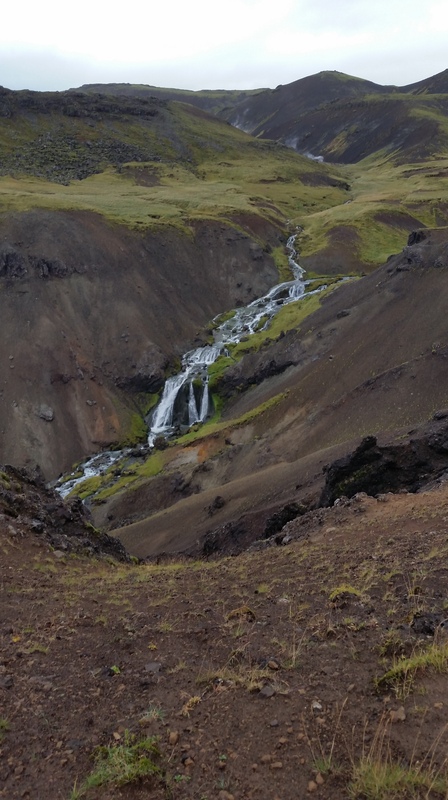 This is because, true to Iceland lore, the weather changed unexpectedly. The sky went dark with clouds and just as the moon was scheduled to turn red, a torrential downpour occurred that lasted the whole night. It was an experience while it lasted. We will hopefully be back in Iceland for the next Supermoon eclipse in about 30 years. One thing we did experience during the eclipse is another perfectly made cup of hot chocolate. The front desk attendant made me the most amazing hot chocolate with melted chocolate bits in a steamer with some milk and Irish Cream. It kept me warm the entire time we were outside. At just after 2am, we collapsed into our beds wishing that we had several more days to experience the sites that we had missed. We planned to get up for a final breakfast with our friends before heading off on our own separate ways.